Well, talk about trying to have your cake and eat it too. Now there was a possibility that, despite our helpful hint sent through twitter, that the Fourniers were still not aware of who Winnicki was after thanking him for his generous donation (if one were to believe it was Connie who had sent him thanks). It seems though now that they are aware of who Winnicki is and have made a change on the GoFundMe page. There are a few things in life that are predictable. Death. Taxes. 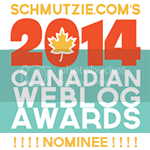 And Tomasz Winnicki will respond to a blog post in which he is explicitly referred to. 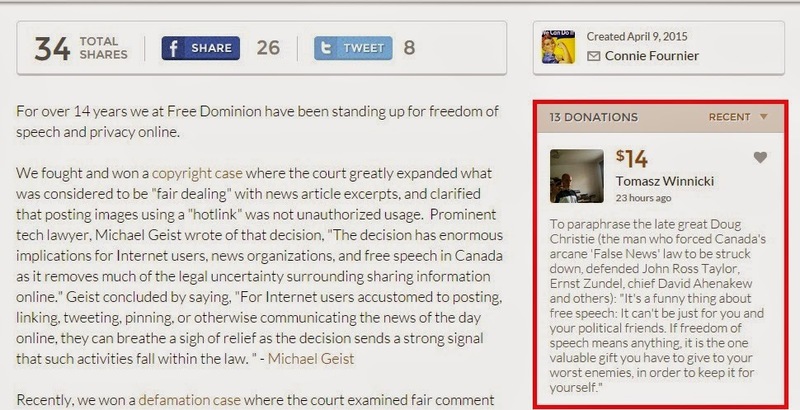 A few days ago we had noted that Winnicki had made a donation to the Fourniers' legal fund established to appeal the defamation suit they had lost. As a result of having been found to have defamed Richard Warman, the Fourniers/Free Dominion and two other posters were assessed a considerable penalty. We mentioned that the Fourniers had yet to repudiate the donation at that time, though we suggested we would give them the benefit of the doubt. 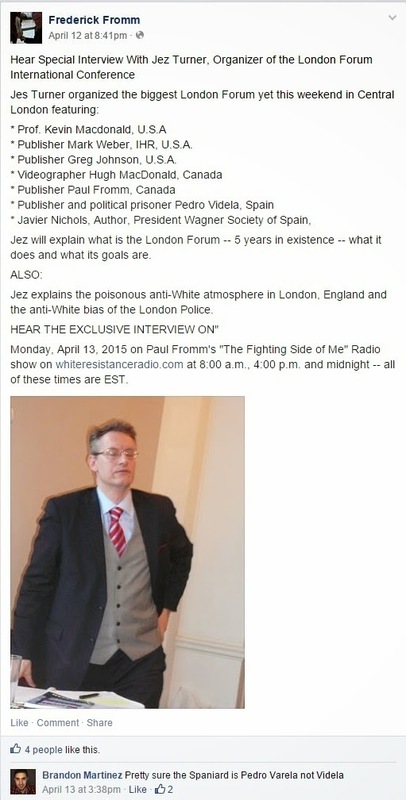 Perhaps they hadn't heard of Tom Winnicki (though he did post on their forum occasionally if memory serves; he may or may not have been banned) or perhaps they had not yet noticed his contribution. 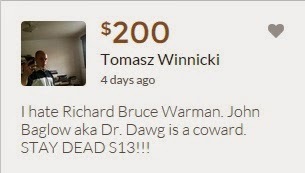 Certainly they wouldn't take money from someone like Tomasz Winnicki if they knew better, would they? Though we did send a link to the article to the Fourniers via twitter, we didn't expect to hear from them regarding the matter. We were sure that we would eventually hear from Tommy. And we did hear from him. Looks like London's biggest hater (his own words, by the way) has warm and fuzzy feelings for Free Dominion. Or more likely vitriolic and caustic feelings towards the people Free Dominion isn't fond of. With him it's more likely the former than the latter. 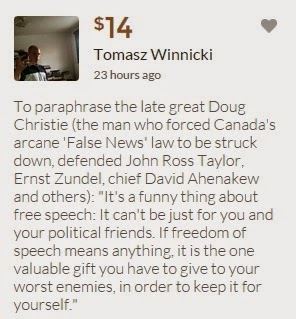 Not long ago, the folks at Free Dominion opened up for business again on a more limited basis, however they soon launched a fundraising effort to appeal the Warman defamation suit that went to horribly against them. 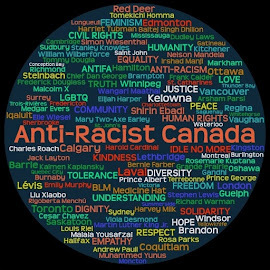 And, much to our surprise, we at ARC even found ourselves agreeing with their position on Bill C-51. We figured that maybe, at least in the short to mid term, they had learned the value of moderation. Uhm, who donated $200 to Free Dominion's appeal? Continuing technology issues seem to have been thwarting our regular writer so I'm going to step in to provide much delayed content. Yep, Nazis. Or Nazi supporters and Holocaust deniers. Really, is there a need to make a distinction? 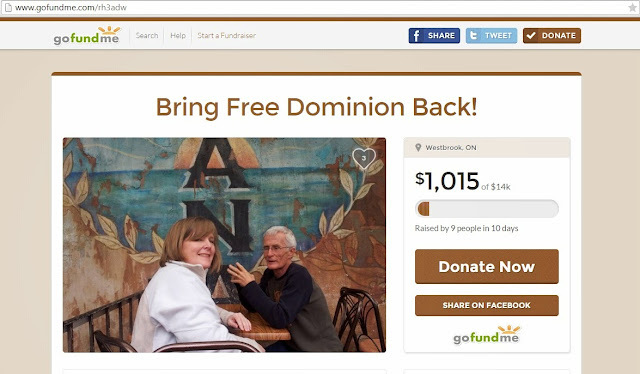 On March 18 we learned that Richard Warman and others started an Indiegogo campaign to help John Baglow pay legal bills resulting from his libel suit against Free Dominion and one of the posters there. As John has been a good friend of ARC over the years, we decided to promote the campaign as well as make our own contribution. The legal-bill Dawgtion ain’t over, but here are the lots that have been put up so far, with their URLs. Bidding will close for all items on April 15. Rare first edition of John Baglow’s first book of poetry, “Emergency Measures” (1976). Official global warming/pirates weak tea mug. Autographed edition of Margaret Atwood’s chilling Oryx and Crake. Signed young adult fantasy trilogy by well-known man-about-cybertown James Bow. For philatelists, an official First Day Cover of a stamp honouring the hundredth anniversary of Frontier College. And “lots” more still to come! Why the ladies aren't knocking down Tommy's door remains a mystery. But we wonder Tom. You had to pay.... what? Was it $100,000 in legal expenses? At least that's the amount was claimed by your supporters. That's a lot of money. We bet that it would have been really helpful had someone liked you enough to assist in paying off that debt. Did anyone help you? Anyone? Did Paul Fromm help you? He certainly attempted to raise funds for CAFE using your particular case. How much of that money did you see yourself? We just figure that Tom is a little jealous of Mr. Baglow and is lashing out like a child would. People like John enough to set up a campaign and raise money on hid behalf. We're not even sure the same would ever be the case for Tom as even his fellow London haters really don't care for him. 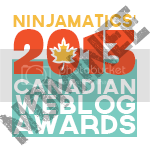 With this in mind, we urge our readers once again to contribute to the campaign to help Dr. Dawg pay his legal expenses. Do it, because Tom Winnicki would really, really, hate it if you did. 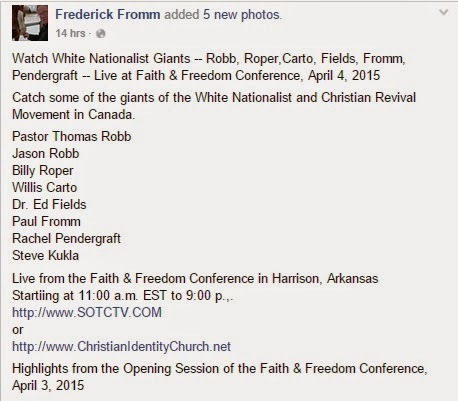 Right now Paulie is currently visiting all his close friends at KKK leader Tom Robb's "Faith and Freedom" Conference in Arkansas. 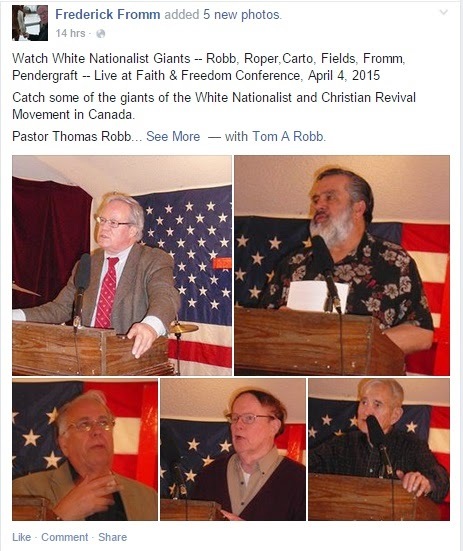 There, Paulie and the other giants of the, "white nationalist" movement are speaking on the issues close to their black little hearts. Now if there's one thing Paulie isn't known for it's his modesty. Really, it takes some real chutzpah to write in the third person an article in which you feature yourself and declare yourself among the greats of the contemporary wn movement, though to be fair that has always been a rather limited pool of applicants. So, who are these other, "giants" Paulie writes of in addition to himself? Right. Like we noted a moment ago, it's a very limited pool.